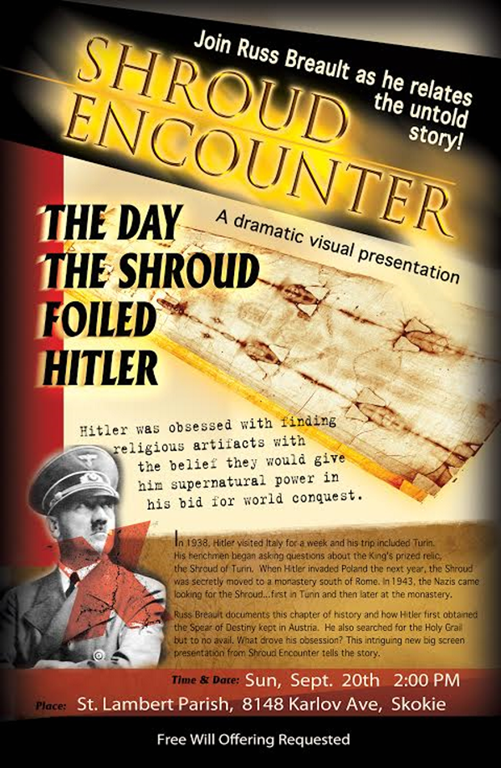 The first presentation is called: The Day the Shroud Foiled Hitler which documents the seven years from 1939 to 1946 when the Shroud was secretly taken out of Turin to keep it away from Adolph Hitler. Hitler was obsessed with finding religious artifacts with the belief they would give him supernatural power in his bid for world conquest. In 1938, Hitler visited Italy and his trip included Turin. His henchmen began asking questions about the King’s prized relic, The Shroud of Turin. When Hitler invaded Poland the next year, the sacred cloth was secretly taken to a monastery south of Rome. In 1943, the Nazis came looking for it, first in Turin and then later at the monastery. Russ Breault documents this chapter of history and how Hitler first obtained the “Spear of Destiny” kept in Austria. He also searched for the Holy Grail but to no avail. What drove his obsession? This intriguing new big screen presentation tells the story. The second presentation is called: Seven Secrets of the Sacred Shroud and will look at seven compelling theological-apologetic reasons why the Shroud is most likely the authentic burial cloth of Jesus. 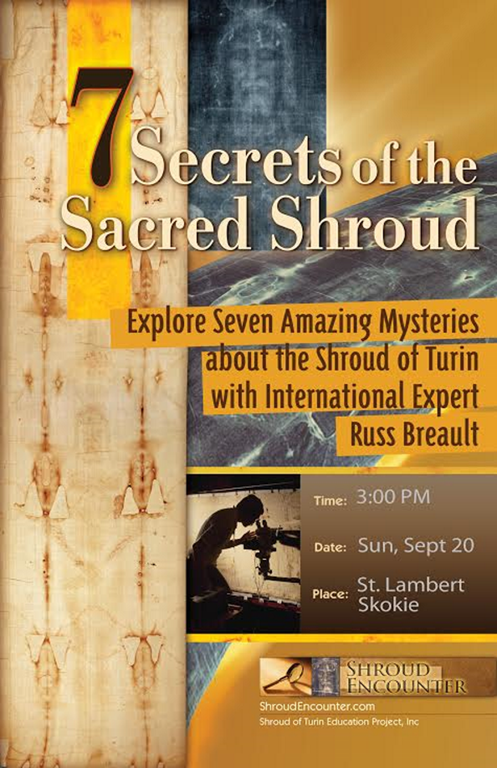 Both presentations are a production of the Shroud of Turin Education Project, Inc. and will be presented by international expert Russ Breault. Mr. Breault has been featured in several national documentaries seen on CBS, History Channel and Discovery. He was interviewed this year for Good Morning America to discuss the latest research. He has presented at numerous colleges and universities including Duke, West Point, Johns Hopkins, Penn State and many others. See ShroudEncounter.com for more info. The Shroud was largely dismissed in 1988 when three carbon dating labs indicated a medieval origin. However chemical research published in a peer reviewed scientific journal in 2005 showed that the single sample cut from the outside corner edge may not have been part of the original Shroud material. In violation of the sampling protocol, only one sample was used for dating and was cut from the most handled area of the cloth, an area that should have been avoided. The sample may have been part of a section that was repaired sometime during the Middle Ages. Many scientists now believe the carbon dating result is inconclusive and should no longer be considered valid. Adding more doubt to the carbon dating tests, new chemical and mechanical tests published in 2013 by Italian scientists with Padua University indicate a date range of 280 BC to 220 AD. The mystery continues. National Geographic called it "One of the most perplexing enigmas of modern times."